In Balloon Cup, the players compete in several short balloon flights (hops) to collect the colored cubes associated with each hop. When a player has collected enough cubes of a given color, he earns the trophy card for that color. Players may even trade 3 otherwise useless cubes for 1 they can use. The first player to earn 3 trophy cards is the winner! Each player has a hand of eight balloon cards. The players play their balloons on mountain or plain hops. Players play their high-valued balloons on the mountains and their low-valued balloons on the plains. Players usually play their balloons on their side of the hops, but winds (and cunning) can cause them to play on their opponentâ€™s side, a move that can ruin their opponentâ€™s plans. This is the English language edition of the game. this game has a bit of luck(because of card drawing) but a great deal of strategy. It's quick to pick up on and can lead to a fast paced game. Sometimes (and it hurts me) you end up giving your opponets points, so strategize well!!!! Up, up and away!!! I find this game can be played at 2 levels. If you are just mildy competitive and strategic, you'll find this to be a fairly short, fun game. Simply try to play your cards in the right location to get the Highest or Lowest points, win races, receive trophies and win. If you are a very strategic player, you can look ahead or remember what's been played in the past. Also, if you know how many cards and cubes are available, it helps you plan your next move or next few moves. I've heard some people say every move is spelled out for you, but I strongly disagree as I can see into the game and the hidden strategies. The game is very easy to learn - probably less than 5 minutes to learn and get the hang of it on the first few turns. So simple to explain and yet so many interesting choices to be had! Definitely a favorite 2-player game at our house. If you pick this up I suggest that you play with the following variant: You can only play cards on your opponent's side of a race if there is already a card on your side of that particular race. Cheers! This is a very enjoyable light 2-player game. It is a good introduction to European-style games, with wooden bricks and victory points rather than heavy theme and direct conflict. Balloon Cup is really a pretty and well themed 2-player area majortiy game. You are competing for dominance of 4 areas by placing cards from your hand on either your own side or your opponents. The fact that you can play directly on your opponents side, is really what sets Balloon Cup leagues above other simple area majority games. With this simple mechanic, you get tons of direct player interaction and at the same time makes all cards usable (if you can't use it, you can use it to fill up your opponents side). It is a fun, light game with a healthy dose of interaction and skillful tactical play. Another great game in the Kosmos 2 player line. This is a lot of fun. I first met Stephen Glenn via e-mail back in 1997. We were both discovering the world of games through the internet at the time. We kept in touch over the years and in 2000 we both lept headlong into game design. That summer we sent game upon game back and forth, sometimes coming up with several new ideas a day. We became good friends before we ever met in person. I finally did meet him face to face in 2001 when a few of us gathered in Virginia for the first "Protospiel". It was the humble beginnings of his vision--a convention for game designers. As I expected from his e-mail, Stephen is a hilarious person to be with. He's one of the few people I know who loves games and designing them as much as I do. I was thrilled for him when I heard Kosmos was going to publish one of the games he showed me during that summer in 2000. When we found out the game would be available this month, I asked if he'd do an interview with us for Fair Play and he agreed. Mike Petty: When you're not designing games, what do you do for a living? Stephen Glenn: I teach English at an alternative high school in Norfolk, Virginia. For those wondering, an alternative high school is one attended by students who have been suspended or expelled from their regular high schools. MP: Have you always been what you'd call a serious gamer? SG: I enjoyed board games and rpgs when I was young, but never really maintained a serious interest after high school [mid-80s]. I had a brief and torrid love affair with Magic the Gathering in the early 90's. Then in 1996 I first went online and typed 'board games' into a search engine. It all kind of exploded from that moment on. That was also the year my daughter was born. Great timing, huh? MP: I remember your old Stratogems website devoted to two-player abstract games. Are those still your favorite? SG: I still have a soft spot in my heart for two-player abstracts, and since my gaming group usually consists of myself and one other person, I'm always on the lookout for interesting two-player games. However, it's no longer necessary that they be abstract and/or luck free. When I ran Stratogems, I thought two-player, no luck abstracts were the only games worth playing. Of course, at that time I had no idea that TGOO (These Games Of Ours) existed. By TGOO, I'm talking mostly about European imports like Settlers of Catan, El Grande, and the like. So, to answer your question, no they are not still my favorite, but I'll always consider them my "first love" -- the one you never forget. MP: What was it that drew you from those games into the German games? SG: One of my best customers, Ben Baldanza, was the individual who introduced me to the wonderful world of games I now enjoy. He knew I liked two-player games, so he suggested I check out Reiner Knizia's Mole Hill. I did, and I discovered an art form and artists I never knew existed. MP: And finally, what made you seriously pursue game design? SG: I love to create. Whenever I develop a passion for something, one extension of that passion is to try to create the thing I'm passionate about. In my life I've composed instrumental music, recorded my own songs (yes I do sing), written children's stories, short stories, one act plays, and screenplays. However, I am, by nature, a very lazy person. By this I mean, while I am motivated to create, I'm not typically motivated enough to make it pay. With game design it was different. When I discovered TGOO in 1997 I had been married for a year with two children (by the way, it's not necessary for you to do the math on that) and had just graduated from college. Most of the gear in my music studio had been sold years earlier to pay for college and I had neither the time nor the money to build it back up. When I discovered Settlers of Catan around the same time, I found something that fueled and seized my imagination like music had before. I developed a passion for games! And, as stated above, when I develop a passion for something it's not long before I start wanting to create my own. MP: Who are your biggest influences? SG: Sid Sackson and Reiner Knizia. There's a definite charm and elegance to their games that are indefinable. MP: Where do you get your ideas for games? SG: I have to be honest. I didn't get ideas for games before I discovered TGOO and began collecting them by the hundreds. So, at least at this point in my development as a designer, most of my ideas probably evolve from things I've seen in other games. I can't say I've had an idea that wasn't somehow influenced from another game. I probably take my favorite parts from those games and use them in ways that are appealing to me. This is not a conscious effort to borrow the hard work of others. It simply means that I have not yet found my "original idea." That is one long term goal -- to become less and less derivative as I go. I've come a long way since my first prototypes. And I've still got a long way to go. MP: I remember the day you first wrote me about the game that became Balloon Cup. Tell us how that one came along. SG: Balloon Cup was originally called Pinata, and the idea came to me after my daughter's fifth birthday party. She had a pinata (Pikachu, I believe) and the image of kids scurrying after pieces of multi-colored candy appealed to me. I specifically remember thinking about it while mowing the lawn one afternoon with my headphones on. I don't remember what I was listening to, but I was definitely in my own little world --grooving to the music while taking the mower on that spiral journey to the center of my lawn. The game evolved almost entirely in my head before I was done. Some things have been changed since, by myself and my publisher, but the main mechanic of Pinata (and now Ballon Cup) has remained constant. MP: How hard is it to break into the industry as you have? SG: I understand it's a terrific longshot. I had been fooling around with Pinata for about a year and was pretty happy with it. In my opinion, it was a solid, light little two player cardgame that had been playtested and enjoyed by some pretty credible gamers. I'm a big fan of the Kosmos 2-player series and I had a friend who was an acquaintance of Wolfgang Luedtke from Kosmos. Through my friend, I sent a letter to Herr Luedtke asking if Kosmos would be interested in taking a look at my prototype. He replied affirmatively, which rather shocked me, so I sent it off. I certainly entertained no real hope of getting published by Kosmos, but I figured it was worth a shot. Several months later I had some ideas for a 2-player sports series and decided to write Kosmos to see if they'd be interested. I had heard nothing about Pinata and assumed they'd passed on it. Well, they contacted me and told me they were not interested in sports games, but that they had had many successful playtests with Pinata and were seriously considering publishing it. This was in February of 2002. In June of 2002 they wrote me and informed me that they had decided to publish it. I really almost fell out of my chair when I read that e-mail. MP: What, so far, has been the most exciting part of the entire process of concept to final production of your game? SG: Probably when Kosmos sent me the graphic file of the Balloon Cup box cover. I mean, this was it, this was really happening! Up until that moment I was concerned that something would go wrong and they would decide not to publish it. But when I saw the box cover (which is beautiful, by the way) I really knew that one of my dreams was about to come true. Before I opened the file I gathered my kids around me and we looked at it for the first time together. I don't think they understood the magnitude of the moment, though. MP: I know I've told you before, but congratulations on a dream come true. What sort of games can we expect to see from you in the near future? SG: Plenary Games will be releasing Jet Set sometime later this year. Jet Set was recognized as a finalist in the 2002 Hippodice Competition. It's a rather modest cardgame, much like Balloon Cup, but it can handle 2-6 players. It's a brain burner. MP: We get a lot of comments at Fair Play from aspiring designers interested in our Independent Designers Program. I know you've started an annual convention for amateur designers. What can you tell us about that? SG: Protospiel is a game designers' convention that will be holding its third annual meeting this year. We invite game designers to come out and playtest each others' designs. We've found that the feedback you can get from other designers is incredibly valuable. We've also held workshops and talk sessions by folks in the industry. We're still very small, but growing. You can read more about it at this site. 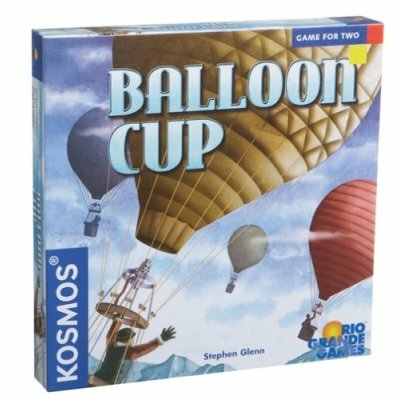 Balloon Cup is published by Kosmos in German and by Rio Grande in English. The English version is expected to be available in April.